On June 23, the first ever Central OC Food Swap occurred in Santa Ana. Started in March 2010, one of the first Food Swaps occurred in Brooklyn, initiated and led by Kate Payne, founder of the Food Swap Network, along with Emily Ho. Since then, the modern food swap movement has spread all over the United States, Canada and even abroad. The Food Swap Network acts as a worldwide registry for all Food Swap events. Most Food Swaps occur in the same format. A Food Swap is a chance for a group of people to bring homemade and homegrown goods and trade with other participants, using a barter system. They are recurring events in certain neighborhoods or regions. The Food Swap usually lasts for two hours, with anywhere from 5 to as many as 40 participants. The Swap starts with 30 minutes of greetings, introductions and set up. The next hour is dedicated to sampling of the different goods and participants write their names on lists of items they are interested in. The final 30 minutes of the Food Swap is when the actual swapping and trading begins. Conceptualized by Sarah Whittenberg and supported by Slow Food Orange County and the Orange County Food Access Coalition, the Central OC Food Swap boasted nearly 20 registered participants; a huge number for its first time. With participants coming from all over the county, one even traveling 70 miles from Rainbow, Calif., the Food Swap had a huge variety of homemade and homegrown goods. There were stone fruits, rosemary jellies and even some plants. There were vegetables from a community garden, different flavors of flan, rice pilaf and backyard eggs. 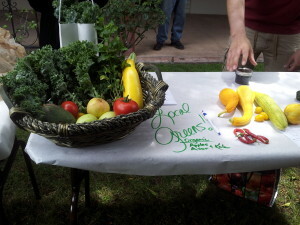 Most of the participants had never attended any other Food Swap, and were thrilled to be part of the first for Central OC. Given the variety of foods and items that were present, one can wonder what constitutes a fair trade. One participant said “whatever you agree on,” a great proof of just how much a Food Swap is focused on community and the relationships amongst it. The idea behind Food Swapping is an “alternative food system.” In this system, one can stretch his or her dollar—having the ability to determine the value of his or her goods through the barter system. Additionally, the format of the Food Swap allows one to expand his or her knowledge and ideas of food, how it is made and the amount of work that can go into a single item. Moreover, the quality of the goods brought to Food Swaps is bound to be better than those found at most commercial supermarkets, free of preservatives and other boosters. They are a great way to diversify one’s pantry and fill it with homemade and homegrown goods. They are also a great way for one to share his or her passion and hobby of food. Above all else, Food Swaps bring together communities. The distant, almost non-existent relationship between producers and consumers that the current globalized food system has created can be rebuilt and made to be stronger. They allow the demystification of knowing the source of one’s food, and providing a platform to establish stronger relationships with the people in one’s community, in one’s own neighborhood. When asked how the idea of starting a Food Swap for Orange County came about, Whittenberg claims the push was not just for an alternative system, but for a community-based need.